Please read below for changes to our deliveries over the festive period. 15th Dec: Deadline for changes to orders for 22nd/23rd AND 29th/30th Dec. Please note that if you are not wanting a delivery in the week of Christmas, you need to cancel your orders for both 22nd/23rd AND 29th/30th Dec. Please note that for all customers, the deadline for any changes to both Christmas orders (22nd/23rd December 2016) and non-Christmas orders (29th/30th December 2016) is Thursday 15th December (not the usual Sunday deadline). In the week of Christmas, anyone with a Veg- or Combo-Box on order for delivery on 22nd/23rd December will receive a ‘Christmas Dinner’ VegBox, to cater for your festive meals. If you do not already have a Veg- or Combo-Box on order for the 22nd/23rd, you can adjust this by logging into your account and amending the delivery for the 22nd/23rd of December. Customers with regular fortnightly/tri-weekly/monthly orders: If you would like a ‘Christmas Dinner’ VegBox and any extras to accompany it, please make sure you either place an order for the 22nd/23rd of December, or adjust the frequency of your regular order to start that week. So you can plan your Christmas catering as precisely as you need, we’ve already set out what each bag will contain, including approximate weights of each veg. Please be sure to tell your guests where their festive meal has come from! If you’d prefer not to receive traditional Christmas veg and would prefer a normal VegBox instead, please make sure you place an order for 29th/30th December. 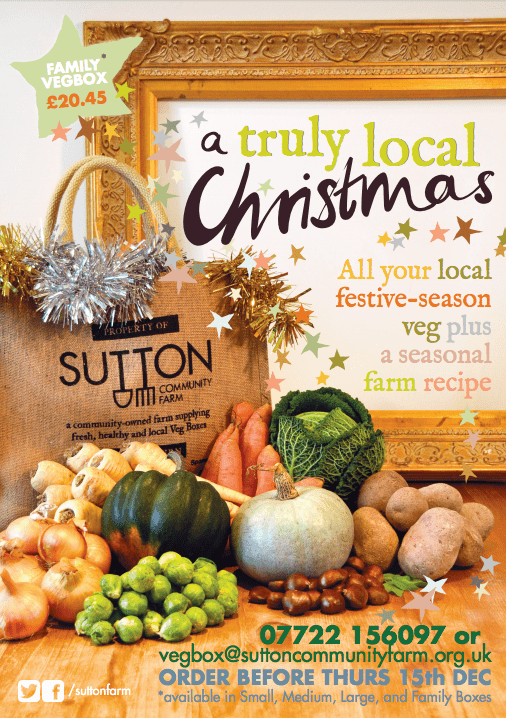 Any orders placed for this week will be a ‘non-Christmas’ VegBox and will also be delivered on either 22nd/23rd December. All changes need to be made by midnight on Thursday 15th December – we will be processing the orders first-thing on Friday the 16th and orders for both 22nd/23rd and 29th/30th December will no longer be editable. We will deliver a double order on Thursday 22nd December or Friday 23rd December (whichever is your usual delivery day). We will not deliver a VegBox in the following week, 29th/30th of December – any ‘non-Christmas’ VegBoxes and extras on order for that week will be delivered along with the ‘Christmas Dinner’ orders the week before, on the 22nd/23rd. If you have an order for both weeks you will be billed for both weeks on 16th December. You will only be billed one delivery fee if you have a double order. The first post-New Year deliveries will be on Thursday 5th and Friday 6th January 2016, and the deadline for changes to these orders will be Sunday 1 January as usual. Extras: Don’t forget that as well as veg and fruit you can also order organic bread*, eggs, honey, Herb Infusion Co. tea grown on our farm, grains and pulses and other individual portions of fruit and veg. As with your Veg- and Fruit Boxes, these can be added to your regular order on a weekly, fortnightly, tri-weekly or monthly frequency, or to an individual order as a one-off. Be sure to scroll down on the Farm Shop to see what else is available! Preferences: Under ‘Your account’, top left and then under the ‘Preferences‘ tab is where you can list things that you would prefer not to receive. Whatever you type in the ‘Preferences’ field will appear on your label to instruct the packers and we’ll replace veg for veg and fruit for fruit. This needs to be completed each week before Sunday midnight. Please note that we will not pick up any changes to preferences for Christmas orders after the Thursday 15th deadline. Delivery instructions: If a SatNav struggles to find your address or if it’s difficult to gain access to your premises, please leave us detailed delivery instructions so that our driver isn’t delayed in trying to deliver your order. And remember that you don’t need to be in when we deliver. Click the ‘Change delivery details’ button under the ‘Delivery’ tab to add or amend your delivery instructions. Please note that we will not pick up any changes to delivery instructions for Christmas orders after the Thursday 15th deadline. A reminder from Gaye our award-winning baker that her bread freezes really well. Just wrap tightly in clingfilm and freeze as soon as possible. Defrost at room temperature overnight. If you require any assistance or more information, please do not hesitate to email or call us.